Once you're viewing your ClickApps Settings page, flip the toggles for the ClickApps you'd like to enable. The dropdown menus above the toggles will let you determine the approved Spaces for each ClickApp. In List View you're able to add columns for each ClickApp and apply sorting! 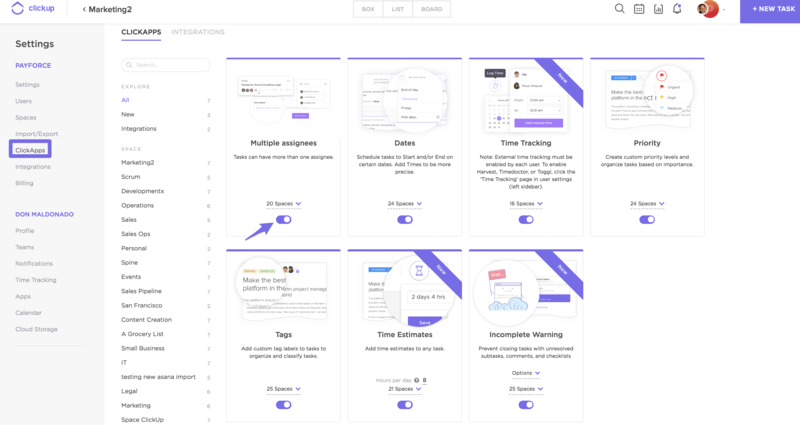 Filter tasks with priorities, assignees, tags, and more! See how our power users take advantage of the various ClickApps here! Our list of ClickApps is constantly growing! Be on the lookout for new features every single week! Do you have other ClickApps in mind that you're not seeing at present? Let us know on our feedback board.